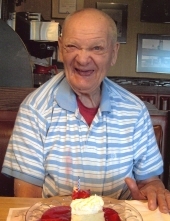 Harold L. LaFrance, age 88, of Onaway, died on Sunday February 3, 2019 at Medilodge of Gaylord. Born in Detroit on October 10, 1930, Harold was the son of George and Ida (Arlt) LaFrance. Well-known in the community, Harold lived in Tower for many years and walked to Onaway every day. Years ago he helped out at Bob and Faye Lee’s store, then at Carter’s IGA, and eventually Tom’s Family Market where he worked washing windows, sweeping, and putting carts away. Very happy and always smiling, Harold loved working at the store and always had a cheerful smile for the customers. He continued to work at Tom’s until he was 85 years old. Harold had a great love of animals; he enjoyed watching the birds and going for rides through the woods and fields looking for deer. He loved outings with his caregivers, especially fishing, bowling, and going to church. Proud to be dressed in his “Sunday best”, Harold knew all the hymns and loved singing at Sunday service. His favorite hymn was The Old Rugged Cross. He had a hearty appetite; there wasn’t much he didn’t like and he loved going out to eat. A familiar face in Onaway for many years, Harold’s big smile and friendly greeting will be fondly remembered. Surviving Harold is his sister, Dorothy Brooks, of Onaway, and his nieces and nephews. Harold also leaves his caregivers who were like family to him, Gwen Wiacek, Bonnie Grulke, and Monica Fleming. Harold was preceded in death by his parents; brother, George; and sisters, Jane Taylor and Rosella LaFrance. Visitation will be at the Chagnon Funeral Home on Sunday February 10, 2019 from 1:00 PM until the time of the funeral service beginning at 3:00 pm. Reverend Arnie Kirschner will officiate. Harold’s final resting place will be with his parents at Hillcrest Cemetery in Onaway. Donations to honor Harold’s memory should be given to Community Mental Health. To plant a tree in memory of Harold L. LaFrance, please visit our Tribute Store. "Email Address" would like to share the life celebration of Harold L. LaFrance. Click on the "link" to go to share a favorite memory or leave a condolence message for the family.